Madeleines are one of my favourite things to bake. They're fantastically easy, fill the kitchen with a gorgeous aroma, and are absolutely delicious. If you don't inhale the whole batch immediately, they freeze very well too. Armed with that knowledge, I made 2 batches this week, and froze them, ready for Mum's birthday party. I'll defrost them the night before, arrange them on a platter and whip them out after the savouries are done and dusted. By the way, I've seen packets of 6-8 madeleines at gourmet supermarkets around town, selling for $10. TEN DOLLARS!!!!!!! How could you justify spending that much on something so simple? They aren't difficult to make like macarons, or full of expensive couverture chocolate like brownies. I admit that the tins are a speciality item, but I got my Baker's Secret non-stick madeleine tray for less than $10 at Myer, and it's lasted for years. I also think these would be worth baking if you just had a patty-pan or mini-muffin tray - they'd taste the same, and I often saw round "madeleines" at bakeries in Japan. However, being an avid madeleine-baker myself, I actually own 3 trays - one non-stick tray with large indentations, one tray for mini-madeleines, and a silicon tray I picked up at Kappabashi Kitchen Town. Unless I'm experimenting with a new flavour, I'll always use the Roux Brothers' recipe for madeleines au miel (honey madeleines), because it is the easiest, and the best. No machinery is required. You just beat eggs and sugar with a spatula (don't be too energetic about it), and fold in flour, baking powder, vanilla extract, melted butter and honey. 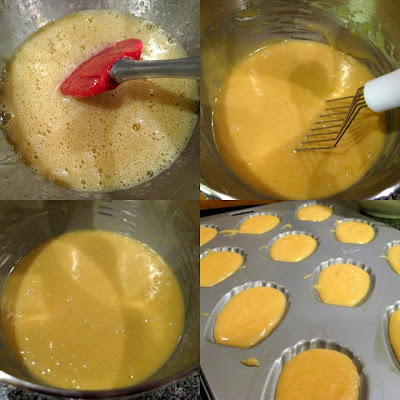 Let the batter sit for 30 minutes, and spoon into your madeleine trays. Full size madeleines only take 8~10 minutes, and the mini ones (see below) take just 5~6. I always thought that the patterned side was supposed to be the top, but in the Roux Brothers' book, they display them with the domed-side uppermost. This week was the first time I tried out the silicon tray. I didn't have enough batter to fill the whole thing, so I just filled what I could, and poured water into the remaining indentations. I read somewhere that that prevents the madeleines from burning. As you can see in the photos (above and below), the batter didn't spread out as much in these ones, and they didn't brown as evenly. They seemed to brown mainly where they came into contact with the metal sheet that the silicon tray had been resting upon. I think I prefer the shape of the silicon mould though; it's deeper and a bit more shell-like. You've inspired me to make madeleines now. It looks quite easy to make. I just have to go and buy me some shell tins. I agree that they just wouldn't be the same without the shell shape. I also love those Decor containers. Did you buy the 4 pack set that was on sale at Safeway. I got the set with one large square container, a medium rectangular container, and two smaller rectangular container. Finally, I made the profiteroles. Thanks for the recipe. They didn't look as good as yours (I think I didn't dry out the milk and flour mixture enough before adding the eggs) but still taste great. Next attempt, croquembouche. Oooh the caramel is scaring me already. Thanh, young man, I got the SEVEN piece set!! My justification is that one day I'll move out of home and I'll need such things. They're all being used though, especially with all this prep for my mum's birthday, so I don't think it's a waste of money :). Congrats on the profiteroles. Can't wait to see the pics! I'd recommend a sugar thermometer for the caramel. I used one when I made caramel for my trial-croquembouche, and it took all the guesswork out of it for me. I haven't made caramel enough to develop the 'eye' for it. Nice bumps. I rike madereines. Thanks for that recipe, I was using Nig's. And, according to Julie, Parisienne, always remember to display your cookies BUMP up! Wow, you really went all out with the containers. They are really useful though. I'll post about the profiteroles soon. They tasted fantastic, just didn't look so good. I've got a sugar thermometer already, so I can use that for the caramel. Aah the Decor Telfresh obsession! We have around 30 Telfresh of various sizes in regular service along with other containers. I use the large ones to store my fresh herbs and greens in the fridge, sandwiching them between sheets of paper towel, which helps them keep for up to 6 weeks. Another large one houses fresh meat and I hide grains from the pantry moths in them too - and of course we have some in rotation for lunchboxes. 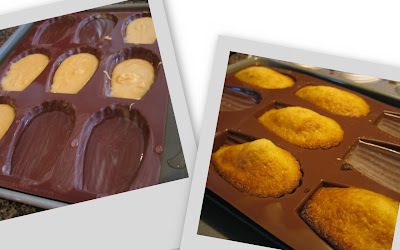 I think perhaps the delicious madeleines in the silicon didn't brown evenly because of the steam coming from the empty recesses you filled with water. Silicone works differently to metal pans and therefore doesn't require putting anything in the vacant vessels. You can also get good results without needing to have the oven quite as hot as for metal trays. I'm sure your mum will love her party, she's lucky to have such a wonderful, caring daughter to prepare such delights for the guests. Enjoy! Thanh - I thought your profiteroles looked delish. I'm glad they went well. Sticky - Thanks for the tip! I'm a bit new to all this silicon business and am still learning how to use it.